- if your bedroom cannot completely be shaded by black-out curtains and you want to sleep in - if you can't fall asleep because your partner wants to read or watch TV - if you want to have a short sleep while travelling, e.g. on airplanes or in trains - if you are looking for perfect relaxation during yoga, wellness or meditation Smartmago Upgraded 3D Contoured Sleep Mask is the perfect solution to ensure that you get a restful sleep to wake up feeling refreshed. - The super soft material is lightweight and easily washable, makes you feel more restful and no sense of pressure exists. - The deepest eye contour never touches your eyelid/eye makeup that you can blink your eyes freely. 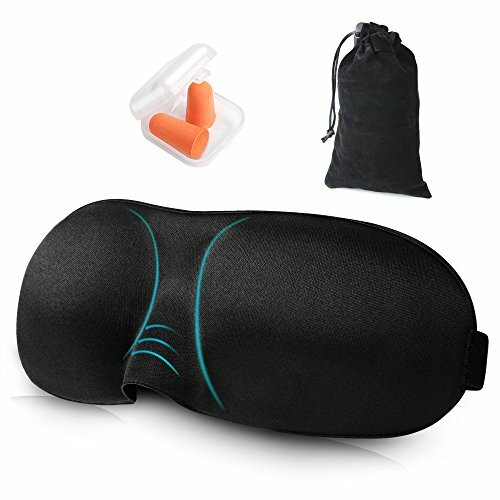 - The sleep mask blocks out the light with noise cancelling earplugs giving you the freedom to sleep and not disturbed. - The Adjustable straps fit all head sizes, ideal for men, women and children. If you are not satisfy of the eye mask, for whatever reason, return it and we'll give you the full refund timely. If you have time, please contact us with any question.  Professional Health Sleep Pattern✨ : Eye mask is human engineering improved, portable packaging with 2 noise cancelling earplugs. Ideal for insomnia, migraine headaches and dry-eye sufferers whether at home, in a hotel or on the plane.  3D Contoured and Nose Flap Design✨ : Unique contoured eliminate eye fatigue, bring stronger shading effect and more contour space than silk sleep mask, will not touch your eyelash/eyelid/eye makeup.  Fully Adjustable and Steady Strap✨ : New flexible strap can surround different size of heads comfortably. From German design, the pain-free band is high elastic and will not catch your hair or snag pillow in any sleep position.  Top Quality and Comfortable✨ : Handmade unique edge treatment process, lightweight & breathable material and nature smooth fabric release your facial stress. Blindfold is no smell help you meditation or get into sleep rapidly.  Service Guarantee✨ : For any customer wanting deep & uninterrupted sleep, our team provide the sleep blinders 1 year warranty, within 24 hours quick-reply and lifetime friendly attitude. If you have any questions about this product by Smartmago, contact us by completing and submitting the form below. If you are looking for a specif part number, please include it with your message.